NASA successfully launched its Mars InSight Lander earlier today. The goal of InSight is to study the crust, mantle, and core of Mars. Unlike previous Mars expeditions, this is not a rover but will stay in one place. The lander will use instruments to delve deep beneath the surface and seek information on the processes that formed the terrestrial planets. 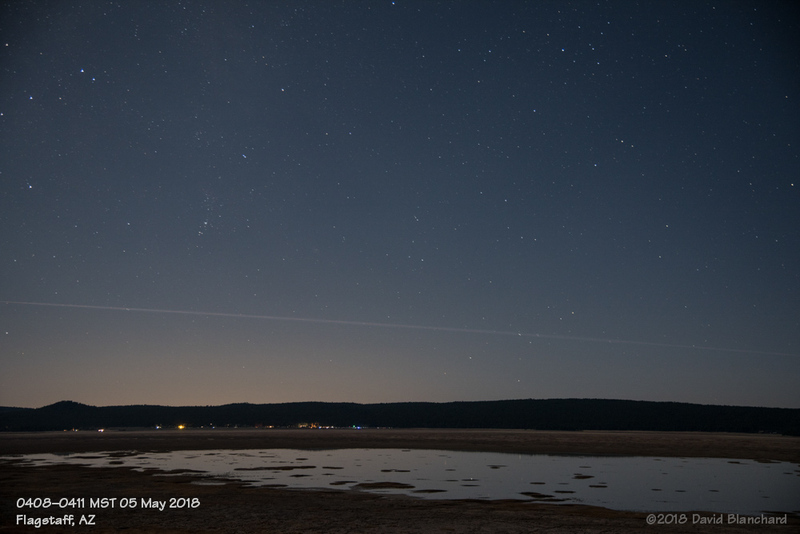 Because the launch was scheduled for the pre-dawn hours, it was possible to see it even in northern Arizona. At least, I hoped so. So I was out and ready for the 4:05 A.M. launch from Vandenburg Air Force Base launch site. The selection of this launch site was unusual as most missions to the planets use the Kennedy Space Center launch facilities in Florida. This was the first interplanetary launch from Vandenburg. I scanned the western and southwestern horizon after the launch but was never able to see anything. Hmmm…not a good sign. But a quick review of the camera images showed that I had captured the launch. From this distance, however, it wasn’t very bright. Each exposure was 15 seconds in duration and were combined into a single image. The path of the rocket can be dimly seen against the sky. There had been some speculation that the deposition of ice crystals into the high reaches of the atmosphere might produce noctilucent clouds. Didn’t happen. The rocket exhaust had time to completely disperse before the morning sunlight hit the upper atmosphere about an hour later.